Mr Trump may not know his Baltics from his Balkans, but I suspect many others would have trouble sticking a dart into the right part of a map. The Balkans cover the countries in the Balkan Peninsular, roughly South-Eastern Europe below the Balkan mountains. You’ve got about twelve languages, give or take a few, in use there, and an awful lot of borders which have been redrawn since the First World War, which is why the port of Trieste sticks out as a bit of Italy. 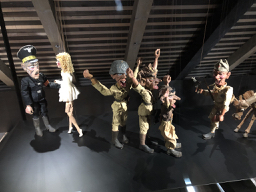 This fragmentation has been so extreme that it even spawned its own word, Balkanisation, meaning ‘the process of fragmentation or division of a region or state into smaller regions or states that are often hostile or uncooperative with one another.’ But for all of the stresses, much of the area could be regarded as a textbook model of co-operation. 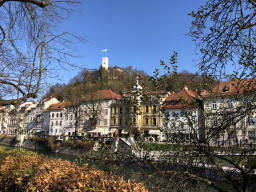 A November weekend in Ljubljana, Slovenia, gets you away from those tourist crowds; too late for sunshine, too early for snow (by a day, it turned out). Slovenians live to ski – I’ve never skied so I’m more interested in creeping about the bookshops, markets, odd little nooks and crannies of a town. This part of the world fascinates me. Europe has more societal extremes than anywhere else – you can cross a few streets and find everything radically changed – yet it’s in such a tightly enclosed space. I imagine many residents are surprised by their new-found popularity. 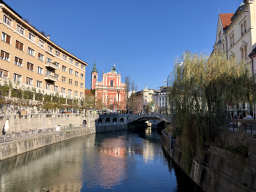 Ljubljana is on the Easyjet hitlist; the flight time is one hour fifty, the town is walkable, the people speak good English and are incredibly friendly. The city was surrounded by a fence with barbed wire and bunkers to prevent co-operation with the resistance. Ljubljana’s trials weren’t over; terrible reprisals resulted in mass graves. Now there’s a commemorative trail where the iron fence once stood. 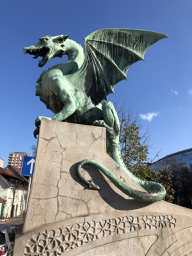 The town is outrageously Instagrammable (although I hate myself for writing that), with its bending river, castle and profusion of pretty bridges, including the Dragon Bridge, so it’s a little bit Prague, a little bit Budapest, but wholly its own place. After the restoration of the city centre buildings hipsters have appeared. 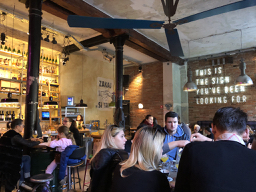 It’s worth seeking out funky CinCin for breakfast, although you’ll have a hard time finding it – like many such towns, the creative people have moved into old warehouses and factories on the edge of town. Food is largely of the scary Hungarian/Polish Big Meat kind; whatever you do don’t over-order. I’ve now got doggy-bag sausages in my London fridge. So, goulashes, suckling pig, pastas (the influence of nearby Italy), trout and of course, sausages. Soups come with a kind of buckwheat gravel that’s delicious. 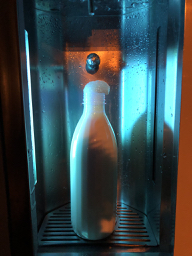 Late at night I ran out of milk but luckily there was a raw milk dispenser in the town square, and given that there’s an excellent market with every kind of greenery imaginable it’s surprising so little of it has found its way to restaurant plates. Slovenian wines are small vineyard and local, with complex whites and butch reds. 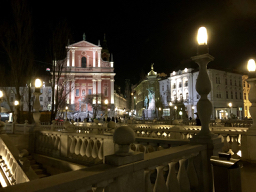 At the moment Ljubljana is pretty much unspoiled, but it has a full calendar of annual events and will inevitably grow in popularity. How it handles that growth will be the town’s next test. Reads like you enjoyed yourselves. 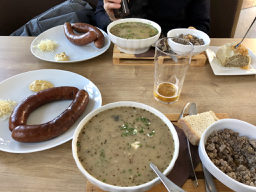 Thank you for the travel guide but all meat and fish and no vegetables definitely puts Slovenia on my ‘don’t bother’ list. I don’t know if Macedonia is so prone to Balkanisation that even the rest of the Balkans noticed, but “macedoine” means fruit or vegetables chopped very small and mixed together. Perhaps the greenery in Ljubljana goes to Macedonia. Not really so many languages, because many are no more than dialects. Serbian, Croatian basically identical, and Slovenian very similar. Macedonian – Bulgarian also basically the same (for a short time Macedonia was West Bulgaria). And all mutually intelligible. Plus Albanian, Greek and Romanian, and that‘s it I think. If you go on the bus down to Belgrade/Beograd, which is not in the EU, there‘s basically no border checks, which does make me wonder why they‘re so vital in Ireland. It‘s another three hours on the bus to Sofia, which is well worth visiting. Very reminiscent of 70s Britain!!! but beautiful country and great food. Re earlier posting, regarding ‘Nobody Ordered Wolves’. I have a copy lurking in a lockup in Llandudno Junction (we are between houses). Jeff Dell was my father’s cousin, and I met Jill Craigie back in the 70s. I would not want to lose my copy, but when it comes to light would happily lend it. I hope you had some Slovenian strudel! My great-grandparents came to America from Ljubljana – I very much enjoyed your pictures.